Shrove Tuesday, Pancake Day, Mardi Gras – it’s time to fatten yourself up before the privations of Lent, if you happen to believe in such things. I didn’t turn out to be quite the good Catholic girl my dear, departed father hoped for but I do still give something up every year. Chocolate, bread, alcohol, crisps and biscuits (what’s the point? ), celebrity gossip (who cares? ), television – over the years I’ve ditched them all for the duration and in some cases never started again. One thing I’ll never give up though is messing around in the kitchen to create healthy food that fuels my running (around all over the place like the Tasmanian Devil). 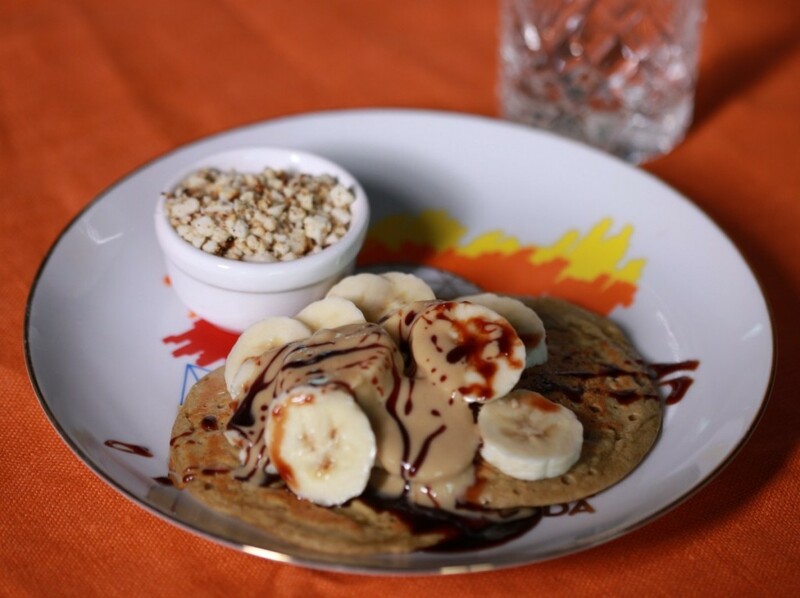 These tasty vegan, gluten free pancakes are healthy enough to keep anyone on the righteous path. They have a decent dose of protein so they’re great for a satisfying breakfast or for post-workout recovery. Add a tablespoon of vegan protein powder and another couple of tablespoons of plant milk if you’ve been exercising really hard. I served mine with bananas, tahini, date syrup and chopped, toasted nuts but they lend themselves well to any combination of topping, including savoury. You can substitute an egg for the chia seeds for a non-vegan version. Buzz the sesame seeds in a food processor or with a stick blender to break the husks. Add all of the other ingredients and whisk together. The mix gets bitter if you do this with a blender so it's best to do it by hand. Heat a little oil and cook each pancake for 2-3 minutes on each side, until cooked in the middle. Serve with sweet or savoury toppings.